Amara Wellness Centre PhotonSmart LED Phototheraphy treatment has many applications and is predominantly used for cosmetic applications. LED (light emitting diode) Phototheraphy is a scientific process that uses specific wavelengths in the visible light spectrum to send light into the deeper layers of the skin to activate and stimulate cellular activity. Phototheraphy is completely safe and does not produce a thermal reaction in the skin which makes this a very comfortable and pleasant treatment. Whilst some results can be seen immediately, best results are achieved from a course of treatments with benefits continuing to show well after the initial course. 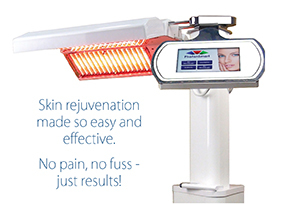 LED Phototheraphy and LED Treatment is a safe painless and non-invasive cosmetic procedure requiring no recovery time. What Can Phototheraphy Treat And Who Can Be Treated? PhotonSmart phototheraphy has many applications and is predominantly used for medical and cosmetic applications. Cosmetically, phototheraphy can assist in rejuvenating the skin, reducing the appearance of the visible signs of skin aging, firming and toning, collagen stimulation, and the treating of acne and problematic skin types. It is also used to assist in reducing skin conditions such as psoriasis, eczema, dermatitis, rosacea and vitiligo. Phototheraphy treatments are suitable for both men and women, and can be safely combined with other cosmetic treatments for even further improved results. How Long Are My Treatments? Treatments last 20 minutes and it is recommended to have a course of 6-12 treatments either weekly or twice weekly. Your qualified technician will discuss your specific treatment goals and devise a schedule to give you the best results. Ongoing maintenance treatments are recommended once every 4-6 weeks to support and prolong the results of your initial treatment course. Are There Any Precautions Before And After My led Treatment? LED phototheraphy may increase skin sensitivity to products and may also increase reactivity to sunlight. It is recommended to avoid direct sunlight following the treatment or use a minimum SPF30+ sunscreen when in sunlight. It is also beneficial to avoid solariums and swimming in chlorinated water whilst undergoing treatments. Your practitioner will also recommend a professional cosmeceutical maintenance program to support your treatments and ensure you get the best results. Your PhotonSmart skin perfection experience is about to begin! Release yourself from the skin problems that restrict your self-confidence and the health and wellbeing of your skin. With PhotonSmart LED phototherapy, everyone has the opportunity to experiences fantastic skin. To find out more about Amara Wellness Centre's Wellness Services and Consultations, or to make an obligation-free appointment with a qualified clinician call Amara Wellness Clinic on (03) 9388 2828 or click the button below to book online.